Mi Casa Es Su Casa is the United Corpus Christi Chamber of Commerce Foundation's women-driven mixer, designed to celebrate the success of women in our community. Join us for the next Mi Casa Es Su Casa honoring C. Michelle Unda, Sr. Regional HR Public Affairs Representative for NuStar Energy, on Thursday, March 21, 2019. Enjoy valet parking, a glass of wine, hors d'oeuvres and good company. Tickets to attend are $25 for United Corpus Christi Chamber of Commerce Members and $30 for Non-Members; event proceeds benefit the Mano a Mano Scholarship Program. Click here for more information and to purchase tickets online. 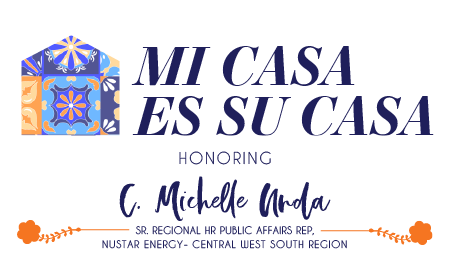 Thank You, Mi Casa Es Su Casa honoring C. Michelle Unda Sponsors! Platinum Sponsors: NuStar Energy, Superior H&M Homes; Series Wine Sponsor: Turner Ramirez Architects; Silver Sponsor: Dr. Mary Jane Garza; Series Supporters: Boys & Girls Clubs of the Coastal Bend, Callaway Resources, Cassandra Teran, CRJ, LLC, Embassy Suites by Hilton, Gilda E. Ramirez, Linda Benavides, My Home Team Media, Nancy Wesson-Dodd, Silvia Martinez-Pacheco, Conni Geary/Wells Fargo Financial Advisors.